For many people, there’s no point or value in dealing with foils. They are just shiny versions of a card that is needed for a deck. If you don’t care, though, you’re missing out on a financial opportunity, especially for the casual markets. Interestingly, foils were introduced before Cubing was invented, and before EDH was formalized…and those formats have really driven foil prices up. Because two of the major casual formats require only one of a given card, the thinking is that you might as well make it foil. Foiling out a deck or a Cube is an undertaking, a project that people feel passionate about. Combine those factors, add a touch of collector fever, and you get casual cards that are FAR more valuable in foil than regular. There is another factor at play when it comes to acquiring foils as long-term investments: reprints. The only time that foils were done in large amounts was the Premium Deck Series, and the all-foil Alara packs, ideas that won’t be used again. This means that reprints will either be nonfoil, judge foils, or in new art when they are put into boosters again. Your investment in foils will be rather safe…and might go up a lot! 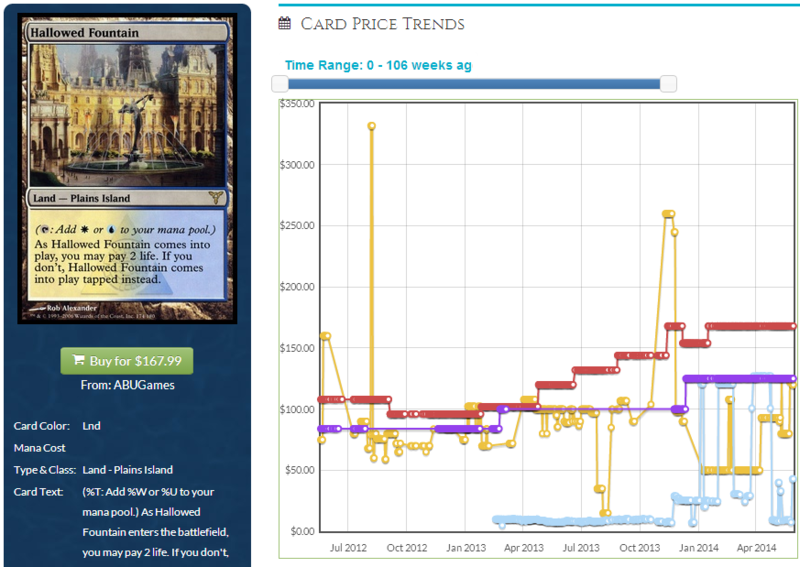 The Fountain was ticking upwards despite being in Return to Ravnica, because the original set foil was that much rarer. Even Modern Masters hasn’t made a dent in most foils. This is notable because the original set foil has the same art and the same wording…but costs twice as much just for a different set symbol! That’s the power of being a collector. Generally, the foil to non-foil multiplier is two to three times the price. If a card is $1, the foil should be around $2-$3. Mythics may or may not have a bigger gap. 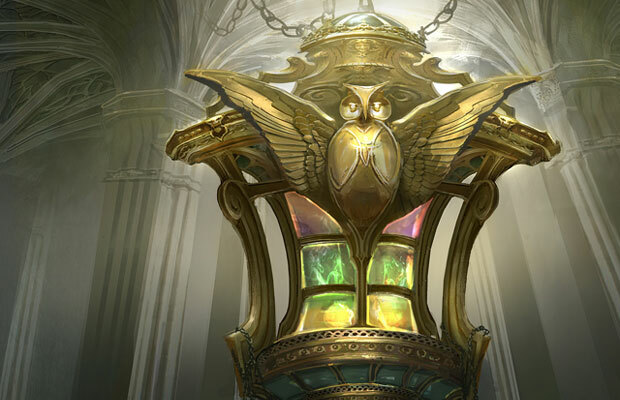 The more formats a card is played in, especially Eternal ones like Legacy, Vintage, or Modern, the more the gap will be due to players wanting to pimp out their decks. Let’s take a look at one of the biggest gaps in recent years: Abrupt Decay. The regular one is about $13 right now, while the foil has a value of $90. Ninety dollars. You could have bought this for $30 for more than a year after its debut. I know for a fact that multiple people were trumpeting Decay as a foil spec and now the ship has sailed. This high gap is because of the eternal playability of the card, because it’s nearly universal and dodges all the counterspells that are played in such formats. Today, I want to go through some cards that have a larger or smaller gap, and explore if that is going to get better or worse over time. Shocklands ($10-15/$30-50) – Considering that these got a little bit of a bump in nonfoil, thanks to Dragon’s Maze and some Event Decks, the price on foil shocks has not gone up significantly…yet. These are a very good candidate to start an upward trajectory. 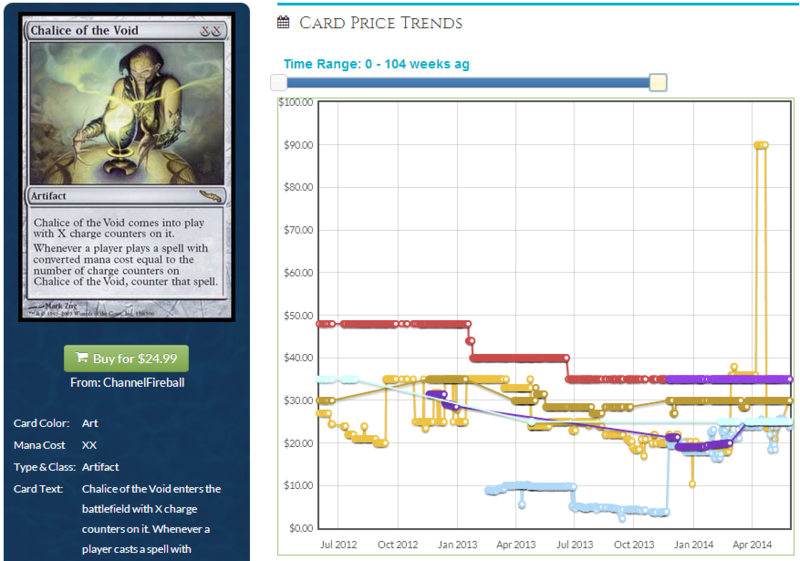 Not a huge spike, but a gradual increase as they are put into Cubes/Commander decks and kept there, lowering the supply. I’ve been trying like hell to trade for these before they go any higher. Boros Charm ($3/$10) – The gap is normal, but the use isn’t. This sees a lot of Modern play as a two-mana, four-damage Burn spell. It’s also amazing in casual formats for saving everything of yours from sweepers. I’ve got a spare foil playset in addition to three foils in different decks, and I’m happy with this potential. Chromatic Lantern ($4/$24) – SHHHHH! Not everyone is aware that this is such a sought-after foil. It’s only the best fixer ever, and colorless, and an accelerator. I’d be on board with picking this up now, as there’s a good chance it clears $30 before the end of summer. Thalia, Guardian of Thraben ($7/$41) – This little lady sees play all over the place. She’s not an EDH fixture, but there are hatebear decks all over Eternal and this is one of the best, making Brainstorm a 1U spell and adding mana to the ‘free’ cost of Force of Will. This is another that’s only going to go up, because as a small set between two large ones, there’s a rather short supply of her in foil. Thespian’s Stage ($1.50/$14) – Look at the price difference between the foil and the regular. Nine times the price gets my attention. That’s a sign of strong casual appeal. If you only need one of a card (for an EDH deck or a Cube) then you might as well make it foil. I do not expect this to go much lower, because all of its appeal is casual. Only cards with high prices due to Standard are going to crater at rotation. Gray Merchant of Asphodel ($.50/$4.50) – Your eyes do not play tricks; that is indeed a $4 foil common. Zombies are one of the most popular casual tribes out there, and this guy is amazing. What makes this stand out just a little more is that Zombies and black decks are very good at mass reanimation, especially in EDH. If the Merchant comes back at the same time as three or four other Zombies, the devotion will be good for seven or so. I’ve drained an EDH game for fifteen each, and it was worth being targeted for the rest of the game. The foil is $4 now, but it’ll creep up over time. I’m going to leave you with a set of speculations that are rather safe, and have big-time potential. Foil Onslaught fetchlands. If these ever get put into Standard, that makes them Modern legal as well. The old frame will command a premium, and foils of that doubly so. I know there are judge foils out there, and those are spicy too if you don’t want to shell out $400+ for a foil Polluted Delta. The supply on these is very small, and there are already Legacy decks shelling out for these. Even if they never make it into Modern, they are going to be a safe place to stash value for a while. Join me next week when I cover what you should be going after in Conspiracy! Great article. Foil cards are hard to move on sometimes, but they hardly lose any value, so I like those as spec targets. I’ve been wondering if now is a good time to pick up foil shocklands. What are your thoughts? Should I wait for the rotation?